RPMforge is developed by RepoForge project Team. 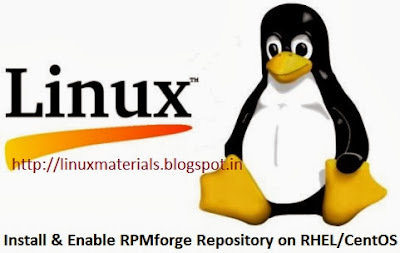 The RepoForge project is maintains all RPM packages for Red Hat Enterprise Linux (RHEL), CentOS, Scientific Linux.RPMforge packages are 100% free. RPMforge Repository is used for downloading third party packages using YUM (Yellowdog Updater Modified) Command. It is working on all Linux paltforms like RHEL, CentOS, Scientific Linux ,etc..
* Installed Third Party Packages using RPMforge Repository. * RPMforge is Open Source and 100% free Packages. If you enable RPMforge Repository, you can install FFmpeg, PhpMyAdmin or any other open source third party softwares using yum command. See above it has 3 repositories are there base, extras and updates. In this Machine RPMforge is not enabled. "RPMforge Repository Configuration file located under /etc/yum.repos.d/ directory." Install many no of open source packages using RPMforge Repository, For example see the information of phpmyadmin software using yum command , It will show the following information.This Package is from RPMforge Repository.